Do Push-Ups Strengthen the Back? Although pushups are known to mainly strengthen your chest, shoulders and arms, they also strengthen your back. When you do a pushup, you must engage your core, which includes your deep abdominal muscles, hip stabilizers and lower back, which is part of the erector spinae muscle group that runs from your hips to the base of your skull. These muscles help to stabilize your body when you're doing pushups, and as long as you maintain proper exercise form, you can effectively strengthen them. Lie on your stomach on the floor. Place your hands slightly wider than shoulder-width apart and flex your feet so you can prop yourself up on your toes. Then push through the palms of your hands to extend your arms and to come into your starting position. Tighten your abdominals and pull your shoulder blades down and back to help keep your back straight. Avoid sagging your belly to the floor or rounding or arching your back. Look at the floor in front of you and keep your hips down -- don't push your buttocks in the air. Glance in a mirror to ensure your body is aligned from your ears and shoulders down to your hips, knees and ankles. It should resemble a straight line. Bend your elbows out and slowly lower your body to the floor, leading the motion with your chest. Your body should move as a whole and always stay straight as a plank. Push through your palms when your upper arms are about parallel to the floor and return your body to the starting position. Avoid completely locking your elbows -- keep them slightly bent, and immediately go into the next repetition. Perform as many pushups as you can until your muscles are fatigued, or work your way up to doing eight to 12 repetitions and two or three sets. Inhale on the way down, and breathe out on the way up, making sure to fully exhale at the top of the motion. 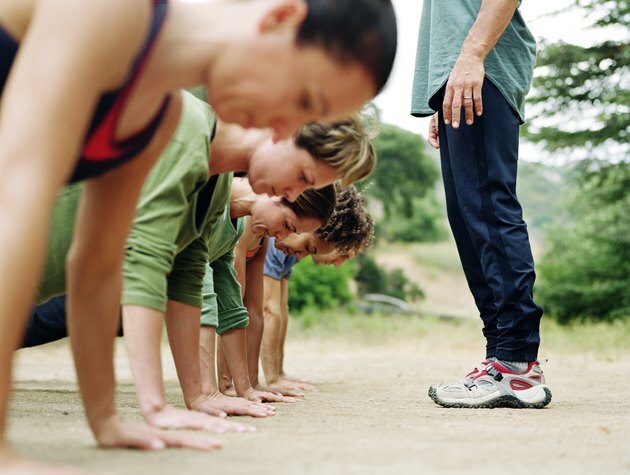 If you can't do a full pushup with straight legs, bend your knees and place them on the floor. Warm up with five to 10 minutes of light cardio before doing pushups, or do pushups in the middle of your workout when your muscles are already warm. Rest for at least 48 hours between workouts so your muscles have enough time to recover. Consult a doctor before starting a new exercise routine, particularly if you're new to exercise or if you have a medical condition or an injury. Do Australian Push-Ups Have Benefits Like Pull-Ups?